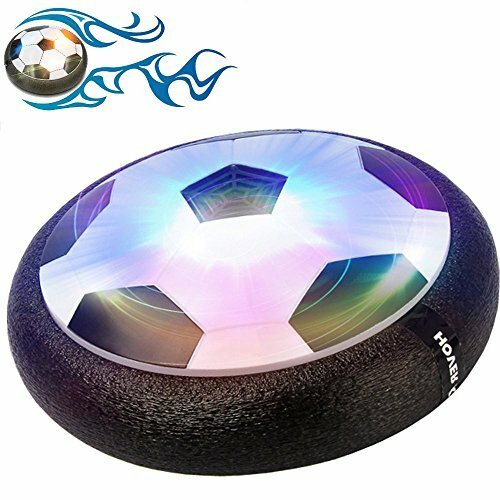 HOVER SOCCER BALL: Our ball toy is hover disigned and led light. Pneumatic suspension tech adopted, the hover ball can float on a cushion of air produced by a powerful fan,easy for it to sail over hard surfaces. Hover ball with led light make your kid's night more funny because of the changeable flashing colors. 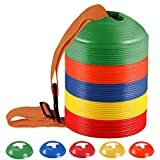 SAFE MATERIAL AND GOOD PROTECTION: Made of Non-toxic plastic, foam edging,flexible, safe and not hurt foot,to prevent the walls and furniture to be damaged.Perfect size enough for small kids or pets to play with. Safe and Fun. WONDERFUL GIFT FOR YOUR KIDS AND PETS: Cool glowing football will attract your kids and pets to play, suitable for indoor sports, making them away from the potential danger of the outside. You can also treat pet depression, you will get a happy family. 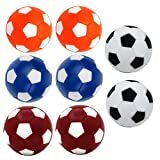 Wonderful birthday gift, New Halloween gift, This football can be a gift for any festival for boys or girls and your pets. EAST TO USE: Easy to install the portable goal. Put your ball on a smooth surface and give it a little kick! The frame of such football is in foam packaging, so the ball can rebound when touching objects. Colorful led flashing lights let the game go on even at night. Requires 4 * aa batteries (not included). 1 YEAR WARRANTY AND 90 DAYS REFUND GUARANTEE: If the air power soccer ball you received doesn't turn out to be what you expected, you can contact for refund as we have 90 DAYS RETURNING POLICY! Any problem you encounter, please contact with our customer service at once, and our service team is always ready to offer help.